You are so lucky to see Neil Gaiman in person! He’s not coming my way anytime soon. 🙁 Are you still reading The Ocean at the End of the Lane? I finished it but want to reread it one more time before writing my thoughts about it. Hugh Laurie is so amazing! I hope you enjoy your week. BUT glad that you had the opportunity. Very, very cool. Vasilly I am lucky indeed! Bryan Yup, I am pretty much still saying wow in my head myself! What a week!! 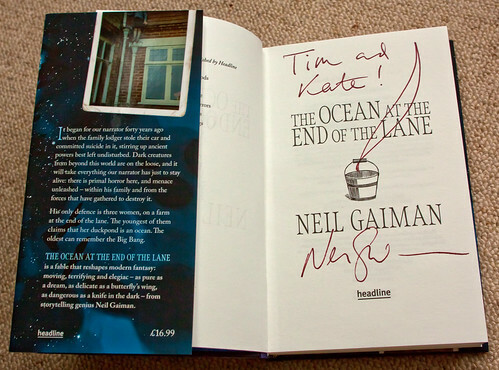 How awesome that you got to meet Gaiman and get a signed book. Tanya Awesome is the right word!